GESOM has 30 years experience in the maintenance service. GESOM started as a service provider for the industrial sector, only a decade after this, GESOM added the renewable sector maintenance. The long experience conferred as a deep knowledge of the more relevant technologies in the market, as well as all associated infrastructures. GESOM applies the highest standards all around the world and has a global health and safety committed. A crucial element for the development of the operation and maintenance activity. GESOM maintenance more than 4,000 MW globally, for different companies. The maintenance división offers a comprehensive service, including the planning and delivery of the qualify resources needed in all regions where GESOM is present. GESOM offers a comprehensive services for its customer starting at the offer. GESOM has its own Technical Department, who are experts in identifying the customer needs, optimizing the resources to offer the best services that fit this needs. Before the team starts working at the plant, GESOM makes an exhausted inspection of the facility, analyzing the different components. The wide experience in the maintenance field makes it possible for GESOM to ensure the efficient and safe in the works. GES offers a wide scope of maintenance services of all systems involved in a wind farm; turbines, blades, substations and médium and high voltage lines. Our commitment is to maximized availability and production of the plant. GES supports customers with long-term agreements, as well as specific one time interventions. The scope of our maintenance service includes preventive as well as corrective maintenance, monitoring of the plants and technical advice. GESOM offers comprehensive operation and maintenance fo solar plants, including the panels and associated infrastructures. GESOM has an operation and maintenance system to maximize the energy production. GESOM maintenance more than 250MW in solar in more than seven countries all around the world. GESOM has its own GMAO for the photovoltaics maintenance, which enables to track the plants, giving an excellent control and detailed background. GESOM maintains wind farms in Egypt for more than a decade now. It was in 2006 when GESOM started cooperating in the maintenance of the Zafarana wind farms. At that time GESOM was maintaining 480 turbines (408 MW) distributed in four wind farms. 60 technicians were working at the same time. In the present time, GESOM counts on 25 technicians maintaining 240 MW. Some country peculiarities are the 365 days shift and the desert area where the wind farms are located. The huge amount of installed megawatts in the country during the last few years conferred a great potential to Egypt for GESOM activity. GESOM started activity in Mexico back in 2006. 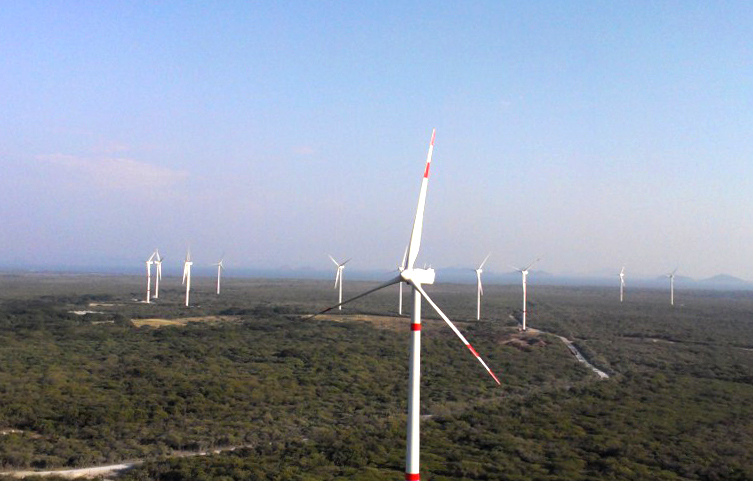 At that time, GESOM maintained 83 MW in Juchitan (Oaxaca, Mexico). In the course of the next five years, GESOM increased its activity in the area, reaching the 300 MW mark. This generated employment for more than 30 local technicians maintaining six wind farms. Over time, GESOM has grown more and more in Mexico, and in the present, the company is maintaining 727 MW, which turned into employment for more than 70 technicians. The location of the activity has also changed during this time, as more and more states have constructed new wind farms, and maintenance has to be done in new Mexican geographies. Although GESOM has an operating center in Oaxaca serving five wind farms, the company is also present in Puebla, Zacatecas or Nuevo Leon.